Anyone considering improving their home will have looked at many options including conservatories, extensions and orangeries. Naturally evaluating the benefits will be top priority when it comes to investment with space, beauty and added value all needing careful consideration to ensure a return on investment. This is where orangeries and sun rooms come into their own, having considerable advantages, particularly in relation to thermal efficiency having the combination of a highly insulated flat roof and high performance self-cleaning roof glazing. Orangeries for many years have been considered the elder cousin to conservatories, adding that touch of grandeur to homeowners existing properties. The investment is seen to reflect a lifestyle, being so much more distinctive than a simple extension or glass room. 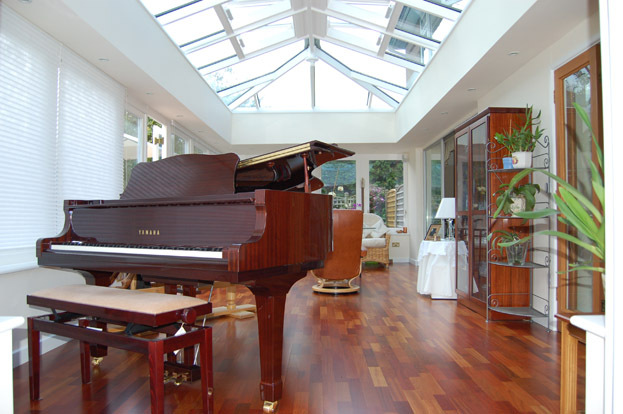 While many conservatories offer the space wanted, they can create untold problems in relation to drafts, temperature control, insulation and glare all of which limit its use. Orangery Solutions recognizes that homeowners want to invest in a highly specified enhancement to their homes. More recently many homeowners have invested in an orangery over a conservatory due to the benefits of year round use as well as beauty and aesthetics. They are recognized to add a touch of distinction providing a look of luxury both internally and externally, that will bring a return on investment. When it comes to reassurance and guarantees however it is important to look deeper than the aesthetics. Although there are many orangery options on the market today for people to choose from, when it comes to structural integrity and lasting guarantees no other system can give the guaranteed reassurances offered by Orangery Solutions. The company offers a patented system which conforms to all building regulation requirements and gives many structural advantages over alternatives. The patented cassette system is proven and guaranteed to withstand a one tonne wind load which no other system can offer. As every project is only undertaken after structural calculations and 3D design plans have been made, investors can appreciate the structural advantages as well as the aesthetic benefits that an orangery will bring to their home when supplied by Orangery Solutions. The history of the orangery and its uses is quite fascinating. Built originally to grow and nurture exotic plants many were established as separate buildings in the homes of the wealthy during the 17th and 18th centuries. In fact, in this period a man’s wealth was measured by the size of his orangery. Today their distinctive style enables people to create a warm and inviting environment which becomes a focal point for entertaining and relaxing in complete comfort, whatever the weather outside. Rather than being a detached building, an orangery provides a modern way to extend a home that adds a real touch of character.. An orangery, with its greater mass of columns, pilasters and classic details creates a striking visual impact and contributes to the overall appeal of a property with a luxurious feel as well as giving a robust and permanent presence. The brick or stone will provide better insulation than a conservatory during the colder months, however the large percentage of glazing still provides a light and airy space. Orangeries also feel more a part of an existing home with walls and glazing providing all the best features of a conservatory and a traditional brick extension combined. Cleverly positioned skylights and lanterns with thermally efficient glass units provide welcome sight of the sky without the uncomfortable and overpowering effect of heat caused by the sun through standard glazing. Paul Nellis, Managing Director at Orangery Solutions comments, “An all-glass conservatory historically has frustrated many people being too cold to use in winter and too hot in summer. Basically, for those wishing to make investment in space you begin with the principle that today an orangery is a luxurious room, tailored to your personal style which adds a touch of class. To discuss your individual requirements or for more information on the Orangery Solutions guaranteed system please call 01904 786629.